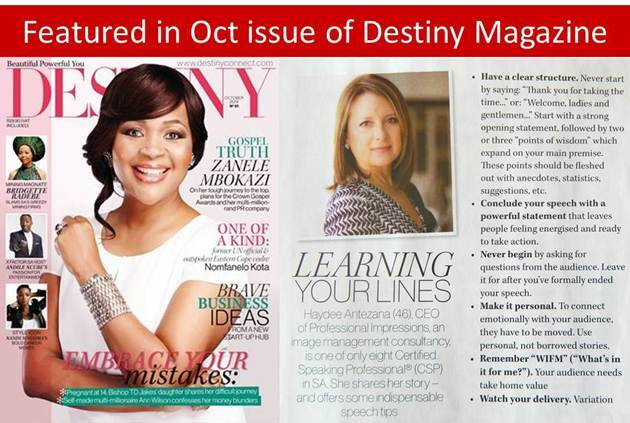 Turn to the latest issue of Destiny magazine – page 36 to read my “story” and obtain essential advice on presentation tips. 1. Have a clear structure. Never start by saying: “Thank you for taking the time…” or: “Welcome ladies and gentlemen…” Start with a strong opening statement, followed by two or three “points of wisdom” which expand on your main premise. These points should be fleshed out with anecdotes, statistics, suggestions, etc. 2. Conclude your speech with a powerful statement that leaves people feeling energised and ready to take action. 3. Never begin by asking for questions from the audience. Leave it for after you’ve formally ended you speech. 4. Make it Personal. To connect emotionally with your audience, they have to be moved. Use personal, not borrowed stories. 5. Remember “WIFM” (“What’s in it for me?”) Your audience needs take home value.